Not long after completing my Resonance Repatterning training 20 years ago, a number of my colleagues and I were inspired to do ‘long distance healing’ sessions for a large group using the Repatterning proxy method. There is a sequence of energy work principles, learned through the training, that leads even the most cynical among us to believe these sessions work and produce positive effects. I personally was thrilled to receive group member feedback on the surprising, unexpected yet delightful shifts that occurred for participants, in my long running annual holiday repatterning for “The Best Holiday Season Ever”. However, one day a man wrote to me asking for proof or research that validates the process. I was stumped. That was 2002 and I then started to search for answers online. In my journey I was excited to discover the research work of Elizabeth Targ, an American psychologist and researcher, who received significant funding to study the power of long distance healing and prayer. It was a long term project and I showed up at the half-way mark where exciting early results had been announced. I tried to get in touch with the researcher only to learn to my deep sorrow, that she had died – at the age of 40 only two days earlier. Her loss was accentuated in that no one else seemed to be doing her type of research into long distance healing – or so I thought. Among the many condolences online, was one from a woman who mentioned that she was covering Targ’s work in her soon to be published work of nonfiction, called “The Field”. Within a few days I had her book in hand and was excited to be able to read about the dozens of scientists working on a variety of alternative healing related topics. The author, Lynne McTaggart, an American journalist, married to a Brit and living in England, reports on the findings of research into alternative healing and energy work , with several notable books to her credit. From her earliest best-selling nonfiction work in the late 90’s “What Doctors Don’t Tell You”, she went on to write “The Field”, “The Intention Experiment”, “The Bond” and most recently “The Power of Eight – Harnessing the Miraculous Energies of a Small Group to Heal Others, Your Life, and the World”. Her curiosity, persistence, and quest for answers brought light to scientists working away at the questions raised in relation to alternative healing. From the dusty basements of many universities and institutions – often closeted away as their work was not considered important – many of these scientists did not know of each other’s research until Lynn McTaggart put them in touch with each other. Lynne is the Agatha Christie of this writing genre, taking the reader through the questions in her mind and those of the scientists – she reveals the answers from the best of the research papers and her own experiments. The reader is left on the edge of their seat throughout this latest book, as she reveals the evidence and makes a startling conclusion about the intending power of a group. 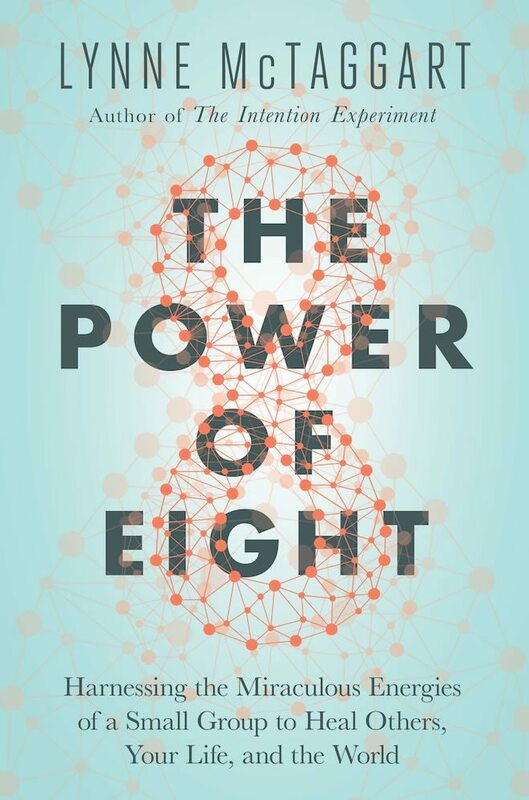 I was excited to hear about Lynne’s newest book “The Power of Eight” as it promised to answer my original questions about the group healing work we do as Resonance Repatterning practitioners – either in person and frequently for a group – in absentia or by proxy. In the Intention experiment, Lynne in collaboration with scientists, set up elaborate controlled experiments, where 500 people in a hotel ball room send thoughts to one of 2 plants in a university lab in Arizona. All done in real time, the plants with loving attention did better that the control plant which received nothing. What she ignored was the experience of the intenders of these experiments. The participants tried telling her about their altered experiences and how things have healed in their lives since that time. This finally got her attention and she decided to study and write about it further. participation as part of a group is different that praying on your own and raises the possibility of the miraculous happening. intending for people outside of ourselves, brings back amazing, unintended results to the intenders; it is as though you as a participant are part of the healing wave. her observation that altruism is a major factor – good healers facilitate from a place of compassion and giving. healing can happen in virtual time. Lynne went from having a controlled experiment of everyone focusing on the same thing at the same time to having intenders look at an image in their own virtual time – it still works. that all you need is a group; in the end the experiments with highly controlled variables were not necessary. One of my favorite conclusions, that Lynne theorizes near the end of the book, is how she describes what I would say is an experience of our interconnectedness. She raises the possibility that human consciousness possesses the ability to create a psychic internet – that we are in touch with anything or anyone by using focused attention to login. What we do in Repatterning work is so much more than everyone staring at a picture of a seed at the same time to intend and create a shift. We are able to use kinesiology and a map to determine the energy that needs to shift, determine the best starting place for the energy to shift, or that is most ready to shift today. Knowing that anything imputed to a living system can change its energy, we have the tools for determining what would create the most appropriate shift. We know that in our group sessions we can include future participants – the hologram of our session is anticipating them in that quantum space where time is non-linear. Most of all we know that it is an interconnected world and we each have our own clearing to do to create the world that we desire. I would recommend this book to anyone who would like concrete evidence that the alternative healing work they are considering or receiving works, and why. It will give you insights and inspiration to clear your own energy field for an enriched life. For Repatterning practitioners, this book will validate for you the work you have studied and now facilitate for others. What we understand as ordinary – for the rest of the world is truly extraordinary. Great article to send to prospective clients or before/after a first session. Carolyn, this is such a great resource for all of us to share. She has such solid credentials it leans the authority we can appreciate to our conversations about energy….Thanks for sharing this!